“It’s designed specifically to accelerate the identification, assessment and investment in energy technology companies for the long-term benefit of our customers and the communities that we serve,” he said. The program will be housed in the @4240 building within St. Louis’ innovation district Cortex. It’s the first corporate initiative for UMSL Accelerate, a program the University of Missouri-St. Louis began within the last year. Chancellor Tom George pointed out that Baxter is an alum of UMSL and has been working with the university for years. “It was just a natural for us to have this kind of a partnership,” George said. The goal is to foster entrepreneurism inside and outside the classroom. George said they hope to draw upon faculty, student and alumni to make the program a success. The University of Missouri System’s new president, Dr. Mun Choi, was also on hand for Friday’s announcement at Cortex. He said he expects the accelerator will provide new technologies for the state and push economic development forward. “We’re going to be looking for breakthroughs from companies that are going to be supported in areas ranging from grid-skill batteries, to renewable energy, to resilience, and to conservation,” Choi said. 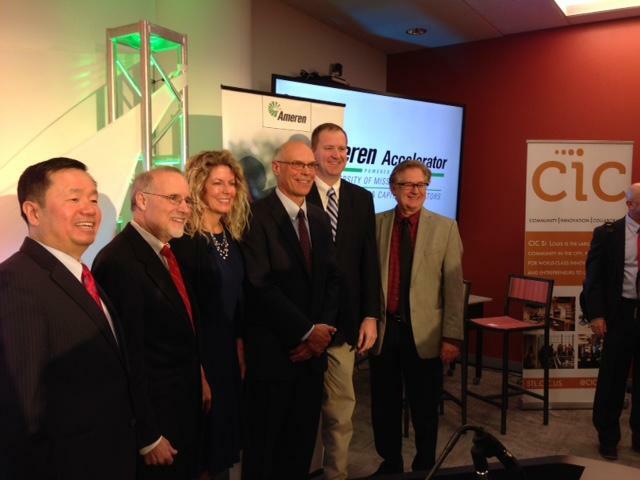 The Ameren Accelerator is a public-private partnership. Pictured from left: University of Missouri System President Dr. Mun Choi, UMSL Chancellor Tom George, Capital Innovators CEO Judy Sindecuse, Ameren Corp. President and CEO Warner Baxter, Missouri Treasurer Eric Schmitt, and Cortex President and CEO Dennis Lower. 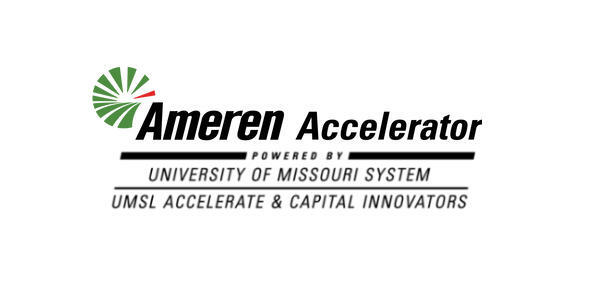 Capital Innovators, the St. Louis-based accelerator program, will help shepherd the Ameren Accelerator program. CEO Judy Sindecuse said entrepreneurs from around the world are trying to tackle energy issues. She expects many applications to the accelerator program will come from outside the region. 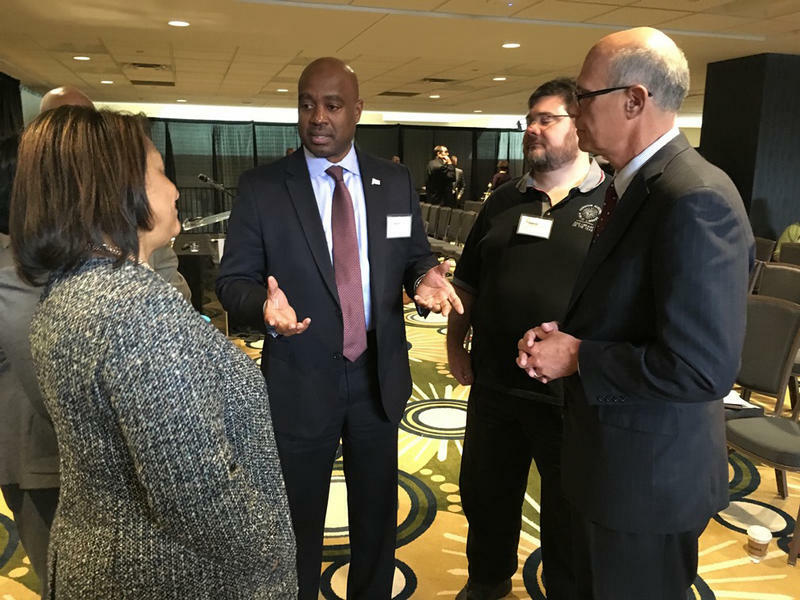 “The idea that they could get help from Ameren and their executives; their knowledge and their connections, as well as the brain power that exists in the university system; there would be no reason not to get on board with this and grow your company here,” Sindecuse said. The program will take applications through May 12th from entrepreneurs and energy technology companies. Those chosen to participate will receive their seed funding in July and begin the 12-week program, that will include mentorship from senior-level executives from a variety of companies. Atomation is a startup based in Tel Aviv, Israel, but the company will soon have an office in St. Louis. The two-year-old tech startup has developed an IoT (internet of things) platform that connects physical objects to the internet. 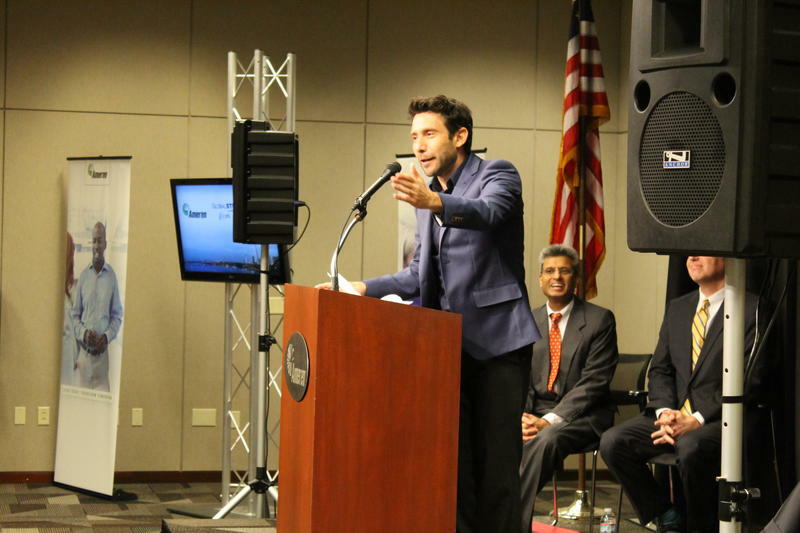 CEO and co-founder Guy Weitzman said the company is already working with four customers in the St. Louis region, including Ameren. Promoting diversity within a corporation is nothing new. But Ameren Corporation announced Thursday it will make its new "Discussion Across Differences" videos and materials available to other groups, free of charge. 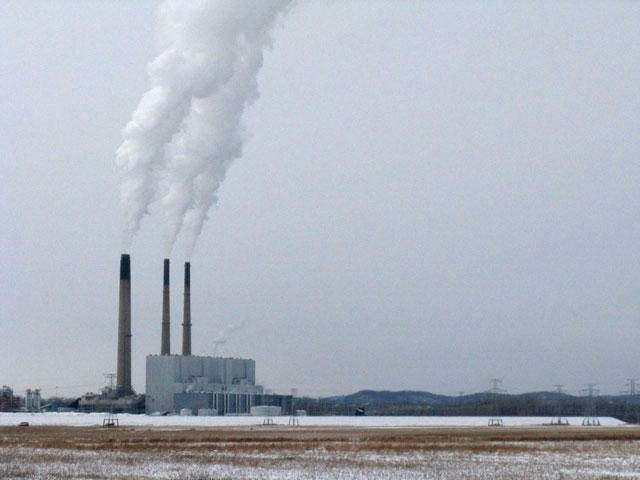 President Donald Trump is expected to sign an executive order today that would relieve coal-dependent states such as Missouri from having to comply with strict carbon emissions limits. The plan to eliminate the Clean Power Plan was announced earlier this week by Environmental Protection Agency Chief Scott Pruitt. About 77 percent of electricity generated in Missouri comes from coal. Under the Clean Power Plan, Missouri would have to cut its carbon pollution by nearly a third by 2030, based on 2012 levels. Coal-fired power plants would be required to curb their greenhouse gas emissions and over the long term, and utility companies that operate them would have to transition away from coal to wind, solar and other renewable energy sources. Missouri is one of 28 states challenging the rule in court. But local environmentalists say there are consequences to removing the Clean Power Plan.